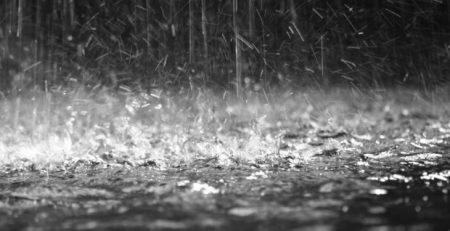 SPRING VALLEY, MN – September 16, 2017: The Creek Open Wheel Nationals scheduled for Saturday, September 16th at Deer Creek Speedway have been cancelled due to current conditions and the pending forecast. The action will pick back up on Thursday, Sept. 21 for the 19th Annual Featherlite Fall Jamboree, where the world’s elite Modified and B-Mod drivers will be racing for three nights and nearly $150,000 in posted prize money. Set for Thursday, Friday and Saturday, Sept. 21-23, fans will witness a complete program all three nights, with $5,000 going to the USMTS Modified winner on the first two nights while Saturday’s winner will pocket a cool $10,000. The Iron Man Challenge Out-Pace USRA B-Mods will battle for $750 to win Thursday, $1,000 to win Friday and $1,200 to win Saturday. An open practice for all drivers will happen Wednesday, Sept. 20, from 6-9 p.m.
Thursday is the final event in the Hunt for the USMTS Casey’s Cup powered by S&S Fishing & Rental with the crowning of the 2017 USMTS national champion at the conclusion of the night’s main event. B-Mod drivers will earn points in both the Iron Man Challenge and Summit USRA Weekly Racing Series national points all three nights. 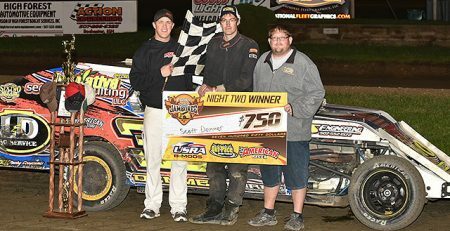 Saturday’s annual Modified Non-Qualifiers Race will dole out $2,000 to the winner prior to the $10,000-to-win championship race which will start a minimum of 30 cars three-wide on the high-banked 3/8-mile clay oval. The Non-Qualifiers Race will also have 30 cars on the track. New for 2017, a second Non-Qualifiers Race for the Modifieds has been added to Thursday’s program which will pay $700 to win and no less than $100 to start for each of the 24 starters. Fans of the USMTS and Deer Creek Speedway once again prove they are the best in the world.